Take advanced professional integrated circuit and SMT, hot air reflow soldering and wave soldering as technical design, which can make sure of reliable quality. Take three units isolated power for metering unit, data processing unit and communication interface unit. All the output signals are handled by optoelectronic isolation, which can increase Electromagnetic Compatibility, and also confirm the stable working for metering unit, that will not influence by communication interface. Build in “Watch Dog” design for microprocessor, to promise for the well working of CPU. Triple backup for metering data. The data are safe even in harsh conditions. Fully sealed dustproof and waterproof design, material of cover has excellent flame retardant and anti-corrosion, anti-aging properties. Build in clock circuit with temperature compensation function, the function can also work when power off and get power source from battery, to make sure of the high processing precision of clock. 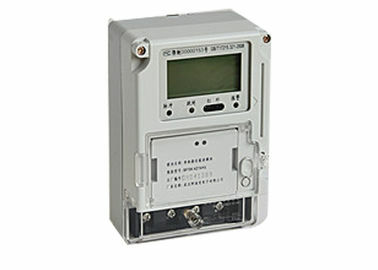 With standard interface of carrier communication module, the meter can work with different carrier modules. With protection card interface for IC card, and also support for CPU card. ＊ Use only isolated tools. ＊ Do not connect the meter to a 3 phase - 415V AC - network. ＊ Place the meter only in dry surroundings. ＊ Make sure the used wires are suitable for the max current the meter can measure. ＊ Make sure the AC wires are installed correctly before activating the current/voltage.